This place will blow their minds: interactive fountains - even a dive-in movie theater. Don't worry about the spills. There's a washer/dryer in every condo. Take full advantage of the resort's health club. Even from the kitchen, you can finally catch that part of the movie you always seem to miss. Stop by for a Gulf swim. Kids will love the indoor water park! They can even enjoy a movie while they swim in the dive-in movie theater! Enjoy a view of the Gulf as you relax along the lazy river. 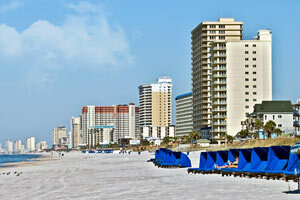 The aptly-named Sterling Resorts - Splash is located directly on Panama City Beach. One of the biggest draws of the resort is the interactive water park with a kids splash area for the little ones. There are three outdoor pools to choose from or spend hours by the pool deck without feeling even a tiny bit guilty. There’s a poolside bar and grill where you can enjoy a laid-back meal and refreshing tropical drink. The kids will love the dive-in movie theater where they can watch their favorite movies without having to leave the pool. Go with the flow on the lazy river and enjoy the views of the Gulf. Then walk over to the beach and run straight for the water for a swim in the gentle surf of the Emerald Coast. Hit the well-equipped fitness center to get your cardio on without missing out on the views – it faces the Gulf. After, you can treat yourself to a well-deserved indulgence at the ice cream shop or coffee shop. Air-conditioned one- to three-bedroom condos sleep six to eight guests. Carousel supermarket is only a mile away and has everything you need to stock your full kitchen. Get your mornings off to the right start with chocolate-chip pancakes, and let the little ones help with mixing the batter. Things might get a little messy, but that’s not a problem; you’ll have an in-suite washer/dryer. After a fun day at the beach, watch a movie on the cable TV with DVD player. Bring favorite movies from home, or browse the selection of free DVD rentals available at the resort. Pop some popcorn and call everyone into the living room. First kid on the couch gets to pick the movie. Pier Park Mall offers a variety of shopping and dining options. If you’re into department stores, there’s Dillards and JCPenney. Get a new swimsuit at Ron Jon Surf Shop or shoes at Nike Factory Store. Kids will love Game Stop and Toy Kingdom. Hungry? Dine at Longhorn Steakhouse, Olive Garden, or Panera Bread. Grab a burger at Five Guys or Red Robin. The animal lovers in your crew will enjoy Gulf World Marine Park. It offers experiences where you can meet, interact with and even swim with dolphins. Interact with penguins and harbor seals or snorkel with stingrays. Surprise the kids with a visit to Shipwreck Island Waterpark. Join your little ones on the Zoom Flume Mat Slide. Let the kids go wild at the Tadpole Hole; they’ll love the activity pools. Brave big kids will have a blast challenging the grownups to a race on the sixty-feet-tall Pirates Plunge dual slides. Ripley’s Believe It or Not Odditorium will be a big hit with fans of the strange and unusual. It features the personal collection of Robert Ripley, the creator of the “Believe It or Not” cartoons. Check out the sculptures that are made out of car parts, the nineteenth-century vampire-killing kit, or an authentic shrunken head. - Front desk is open 10:00 AM-4:00 PM and is closed on Sunday. If you are planning to arrive after 3:00 PM please contact the property in advance using the information on the booking confirmation. Check-in is at 3:00 PM but cannot be guaranteed until 6:00 PM. For more details, please contact the office using the information on the reservation confirmation received after booking. The guest making the reservation must be at least 25 years old and must occupy the rental the entire term of the reservation. Singles under 25 years old are prohibited unless accompanied by parent or legal guardian. Restrictions apply regarding the number of people that may accompany a parent or legal guardian.